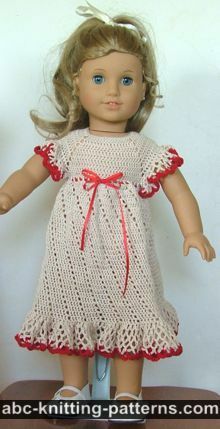 This summer dress is part of a matched set of crochet summer dresses for a girl and her doll. 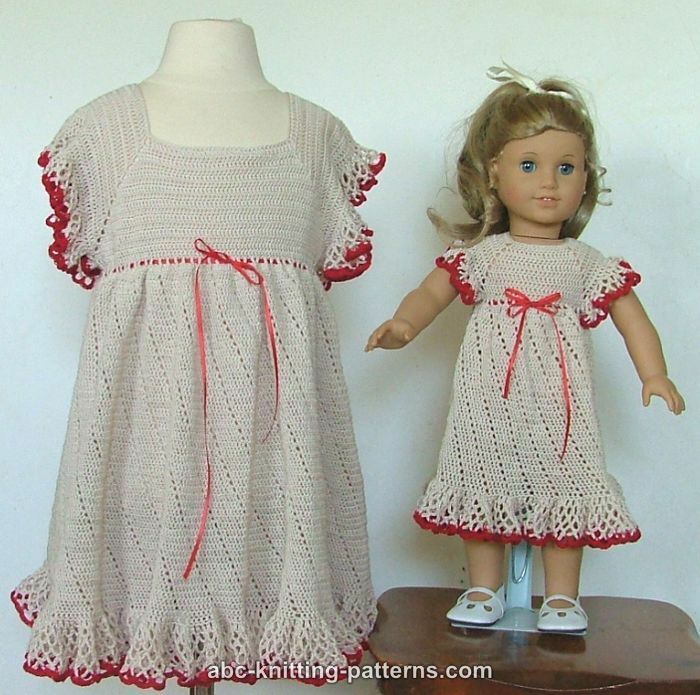 I crocheted this set for my niece and she loved that she could match her doll! This page describes the girl's dress. The dress features a square opening and raglan-style sleeves. The closure is on the back. 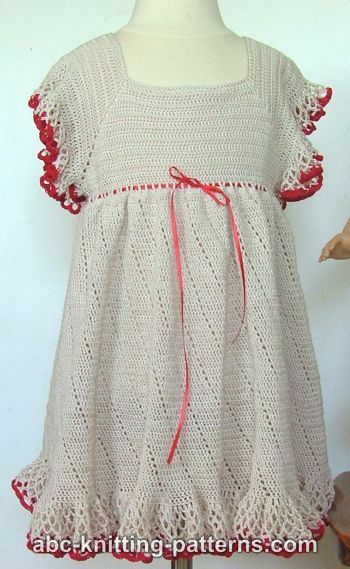 The dress is crocheted from top to bottom, back and forth for the yoke, and in rounds for the skirt. The skirt features a simple lace motif. 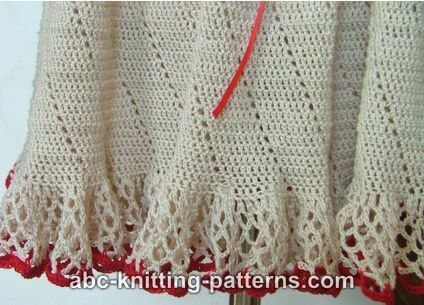 I worked a different lace motif around the the hem and sleeves to create some frills. The doll's version of the dress is constructed pretty much identically, except to a smaller scale. 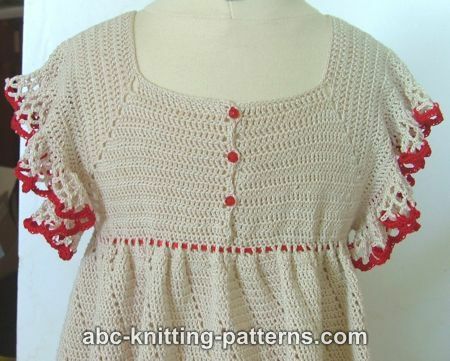 Materials: Red Heart Classic Crochet 100% cotton thread, size 10, 1000yd / 914m color Ecru- 1.5 balls. 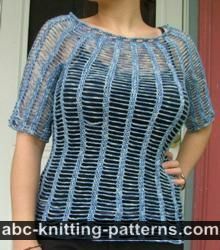 The dress is worked from the top to the bottom, yoke is worked back and forth, skirt is worked in rounds without seams. Chain 83, (112, 141, 170) loosely. Row 1: 1 dc in the 4th ch from the hook (counts as 1 dc), 1 dc in each of next 8 (12, 16, 20) ch, ch 2 (don't skip the ch), [1 dc in each of next 21 (28, 35, 42) ch, ch 2 (don't skip the ch)] 3 times, 1 dc in each the next 9 (13, 17, 21) ch. Turn. Repeat row 2 8 (10, 12, 14) more times. 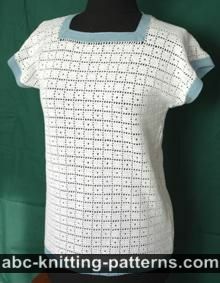 Next Row: ch 3, 1 dc in each dc across to raglan increase, 2 dc in ch 2, ch 6, 2 dc in ch 2 of the next raglan increase (skipping right sleeve stitches), 1 dc in each dc across to raglan increase, 2 dc in ch 2, ch 6, 2 dc in ch 2 of the next raglan increase (skipping left sleeve stitches), 1 dc to the end of the row, join to connect the round and continue to work in rounds. Next Round: ch 3, dc in each dc across the round, 6 dc over ch 6. Round 1: ch 3, (1 dc, ch1) in each dc across the round (doubling the number of sts), sl st to ch-3. Round 2: ch 3 (counts as 1 dc), 1 dc in each of next 6 dc, ch 1, skip 1, *1 dc in each of next 7 dc, ch 1, skip 1, from *repeat to the end of the round, sl st to ch-3. Round 3: ch 4 (counts as 1 dc and ch 1), skip 1, 1 dc in each of next 6 dc, 1 dc in ch 1, ch 1, skip 1 dc, *1 dc in each of next 6 dc, 1 dc in ch 1, ch 1, skip 1 dc, from * repeat to the end of the round, sl st to ch-4. Round 4: ch 3 (counts as 1 dc), 1 dc in ch-1, ch 1, skip 1, * 1 dc in each of next 6 dc, 1 dc in ch-1, ch 1, skip 1 dc, repeat from * to the end of the round, sl st to ch-3. Round 5: ch 3 (counts as 1 dc), 1 dc in next dc, 1 dc in ch-1, ch 1, skip 1, * 1 dc in each of next 6 dc, 1 dc in ch-1, ch 1, skip 1 dc, repeat from * to the end of the round, sl st to ch-3. Round 6: ch 3 (counts as 1 dc), 1 dc in each of next 2 dc, 1 dc in ch-1, ch 1, skip 1, * 1 dc in each of next 6 dc, 1 dc in ch-1, ch 1, skip 1 dc, repeat from * to the end of the round, sl st to ch-3. Round 7: ch 3 (counts as 1 dc), 1 dc in each of next 3 dc, 1 dc in ch-1, ch 1, skip 1, * 1 dc in each of next 6 dc, 1 dc in ch-1, ch 1, skip 1 dc, repeat from * to the end of the round, sl st to ch-3. Round 8: ch 3 (counts as 1 dc), 1 dc in each of next 4 dc, 1 dc in ch-1, ch 1, skip 1, * 1 dc in each of next 6 dc, 1 dc in ch-1, ch 1, skip 1 dc, repeat from * to the end of the round, sl st to ch-3. Round 9: ch 3 (counts as 1 dc), 1 dc in each of next 5 dc, 1 dc in ch-1, ch 1, skip 1, * 1 dc in each of next 6 dc, 1 dc in ch-1, ch 1, skip 1 dc, repeat from * to the end of the round, sl st to ch-3. Repeat rounds 2-9 to desired length, keeping in mind that there will be 2” (5 cm) ruffle. For a wider skirt increase evenly from 7 dc to 9 dc in each 7-dc group of stitches. Rounds 3-7: repeat round 2. Work round 7 in red. Round 8: in red, (5 sc in each ch 5), repeat to the end of the round. Tie off. Rounds 3-5: repeat round 2. Work round 5 in red. Round 6: in red, (5 sc in each ch 5), repeat to the end of the round. Tie off. Work 1 row of sc along the back opening making 3 button loops along the right back center as follows: ch 3, skip 3. I also wonder why my dress turns out to be so waved? I don't know if I did wrong at the 6 Dec in each scored but it's very wavy ? Bust is 26.5", waist is 23.5". Having trouble getting the " holes" to match up after row 3. It seems to be OK doing next row Nr 4 as Nr 2, but I need to know, the 7:th dc, is it to be made in the ch 1 or in the around ch 1? I mean in the sc of the ch 1? How long is the finished dress for a size 8? Thanks for this beautiful dress pattern. What are the measurements of a finished dress for a 4year old and a 5 year old. Thanks in advance.